1 Place a large pot with lid (a 5-quart Dutch oven works well) over medium-high heat. Add Organic Valley Ghee to the hot pan. When ghee is melted, add onions. Sauté, stirring occasionally, for 5-7 minutes or until onions start to soften. Add garlic and cook, stirring, an additional 30-60 seconds until garlic is fragrant. 2 Add cauliflower florets, broth, thyme, and rosemary. Stir and increase heat slightly to bring the liquid to a low boil. Reduce heat to medium-low and cover pot with lid. 3 Allow cauliflower to cook 20-25 minutes or until very tender (but not mushy). 4 Remove lid from pot and reduce heat to low. Carefully remove ½ of the cauliflower and broth to a blender pitcher or food processor and blend until smooth. Alternatively, you can use an immersion blender right in the pot and blend until some chunks remain. 5 Transfer blended soup back to pot, stir in Organic Valley Grassmilk Whole Milk, Organic Valley Grassmilk Raw Sharp Cheddar Cheese, and kale. Heat over low heat 3-5 minutes or until kale is wilted. 6 Remove soup from heat, stir in Organic Prairie Bacon, fresh chives, and parsley. Taste and adjust salt and pepper as needed before serving. 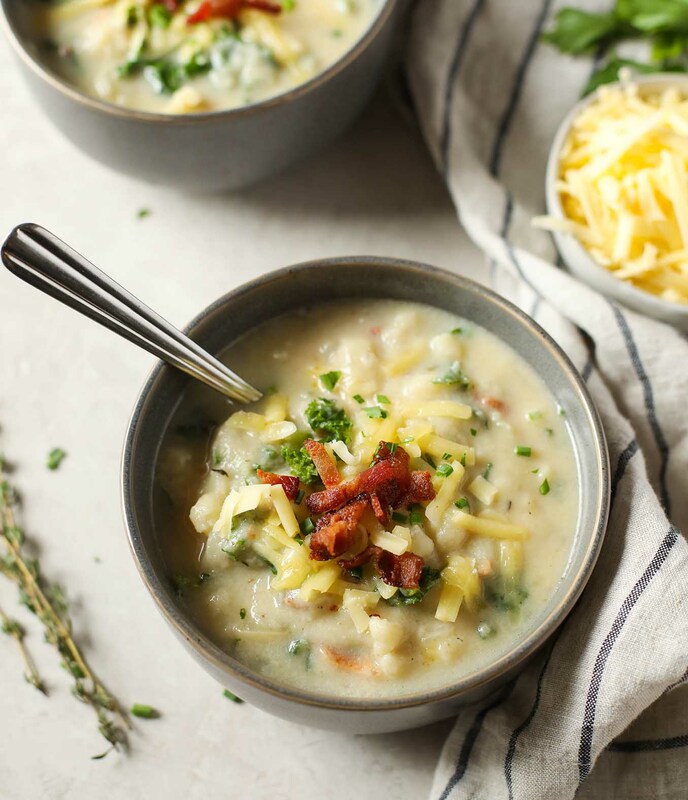 What other meal allows you to throw a bunch of things into a pot and turn it into something that is warm, hearty, nourishing and even better the next day? Only soup can do all that.